I hadn’t heard of this book until the movie came out and got so much Oscar-attention. Then I came across the book in the library and was intrigued: it’s a hefty hardback with a spine about three inches across, yet it’s the recipient of a Caldecott award (the award for best picture books). But open up the book, and you’ll find it’s half text, half illustration. It’s a beautiful, visual book. Brian Selznick is both the author and illustrator. I love when the author and illustrator are the same because then you just know it all works together. No arguments about what is the vision for the book. It doesn’t happen often (an example is my favorite Dr. Suess) but it’s great when it does happen. The Invention of Hugo Cabret is about a young boy who lives by himself in a Paris train station around 1920. His father died, his uncle disappeared, and he’s hiding from the Station Inspector to avoid being sent to an orphanage. He maintains all the clocks in the station so the Inspector will think that Hugo’s uncle is still around. This is a strange story but it totally works. The illustrations are simple but powerful. Selznick accomplishes something that most illustrators don’t – his illustrations don’t just show you things, but movement and emotion. For example, he shows you Hugo running from the inspector in a series of illustrations that really make you feel you’re running beside him. It’s hard to explain but there it is. It’s also a really cool story. I think it won’t be telling too much to say it starts out being about the history of turn of the century robotics but ends up being about the dawn of movie-making. Since I have a thing for turn of the century illustration (Arthur Rackham, Maxfield Parrish, Mucha, etc.) I loved the exploration of art through film-making. The book gives you a lot of information about the history of film. Sometimes when a book is written to explain, it doesn’t do a good job of entertaining. This book puts it all together in a dramatic story. That said, did the movie live up to the book? Yes, but no. Yes, in that it’s very faithful to the book. No, in that the movie isn’t paced quite right, because ultimately this is a children’s book and doesn’t have two hours worth of stuff in it. I don’t like children’s books being made into movies, for the reason that stuff always has to be added. But being too faithful to the plot of a book doesn’t work either. It’s a Catch-22 but in my mind the solution is DON’T MAKE GREAT CHILDREN’S BOOKS INTO MOVIES. Look at all the horrible movies that are being made from Dr. Seuss books. I wish they’d stop. It’s better with books for older children, just stop making picture books into movies, please! I found Hugo the movie a little slow. Ultimately, it was a nice rendition of the book, but left me feeling it didn’t ADD anything to the book. Now, I’ll never know how I would have experienced that movie without having read the book. That’s a choice you have to make, one way or another. See the movie first and the book is diminished. Read the book first and the movie nearly always suffers by comparison. Hugo is probably a fantastic movie without being compared to the book — but compared to the book it suffered, even with its beautiful graphics and impressive actors like Ben Kingsley. The book did a better job of conveying Hugo’s feelings; the movie just felt a little forced to me. Maybe it was the acting, maybe the pacing, or maybe it’s just that some movies work better than others when you already know what’s going to happen (for example, Titanic is still an entertaining movie and you know how that one ends). Of course, this is just my opinion (as always) — did you see the movie or read the book? What did you think? I just discovered your blog. It looks very nice and well developed. I am a school librarian (and writer). In my elementary library we have an extensive wait list for Hugo which goes all the way back to December (a second copy was lost or taken?). Anyway, my point is that it’s so nice to see the kids so excited about the book itself, even if it was the movie that drew them to it originally. Perhaps adults are more discerning than the kids?? I have yet to see the movie myself. Thanks. http://www.marcyblesy.com . Thanks for visiting! I’m glad to hear demand is so high for the book. I think people forget how much kids love books, maybe now more than ever. I haven’t seen the movie yet (I will, eventually, I promise! ),but now I really, really, want to read the book!! my 9 year old daughter is currently reading Wonderstuck (also by Brian Selznick). A beautiful book well worth a look !!!! I have quite a different viewpoint than yours about Hugo Cabret. While I certainly agree that the Dr. Seuss movies that have been made are terrible films, it’s not necessarily the source material. It’s the execution. I also thoght Titanic was an awful movie independent of “knowing the ending”, which is only true in broadest sense (the ship sinking). 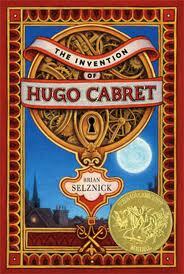 I would have never read “The Invention of Hugo Cabret”, but for the film. I only sought out this lovely children’s book because I thought the movie was beautiful, inspiring and magical. Even though the movie added plot elements and did not focus on everything the book did, they are both wonderful on their own terms. I loved the movie then loved the book, both for different reasons. Of course, this neither makes you wrong nor me right. Both are just opinions and like a number of body parts, everybody has one.